Last weekend I was at a local thrift store with Ruby and I saw a box of old sheet music for 95 cents each. They had the most beautiful designs and lettering and turned out to be half off so I bought a few even though I'm not sure what I will do with them yet. This one from 1898 especially caught my eye because it reminded me of a dress that been hanging on the "fix-it" rack for a couple days (actually days turn into weeks pretty quickly around here). 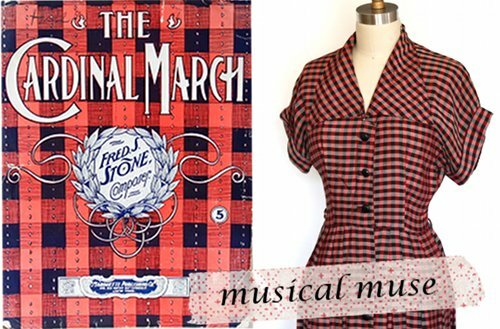 I though it would be fun to share these "friends" and hopefully this 1940's dress will be in the shop soon! This post is inspired by Oh Joy's "this & that" series.